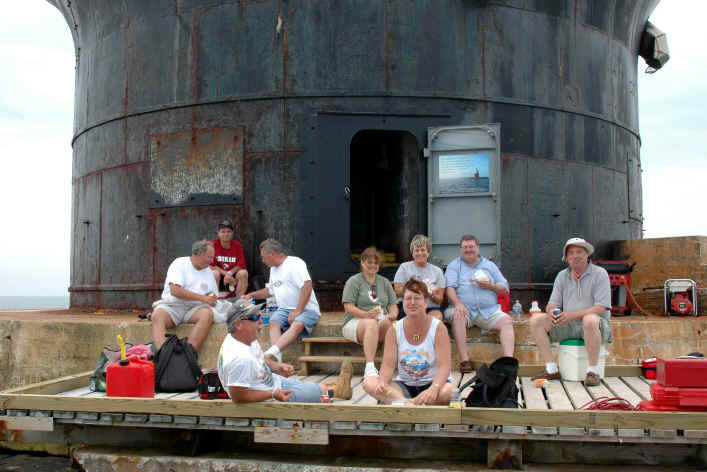 Volunteers on the June 13 work trip take a lunch break in front of the new door at Harbor of Refuge. Left to right: back row -- Mark Lizzi; middle row: Red Moulinier, Belzona tech rep Vince Brady, new volunteer Geri Gaskill, Ruth Africa, Dave Lowe, John Gordon; front row: Jerry Perrin and Charley Podedworny. 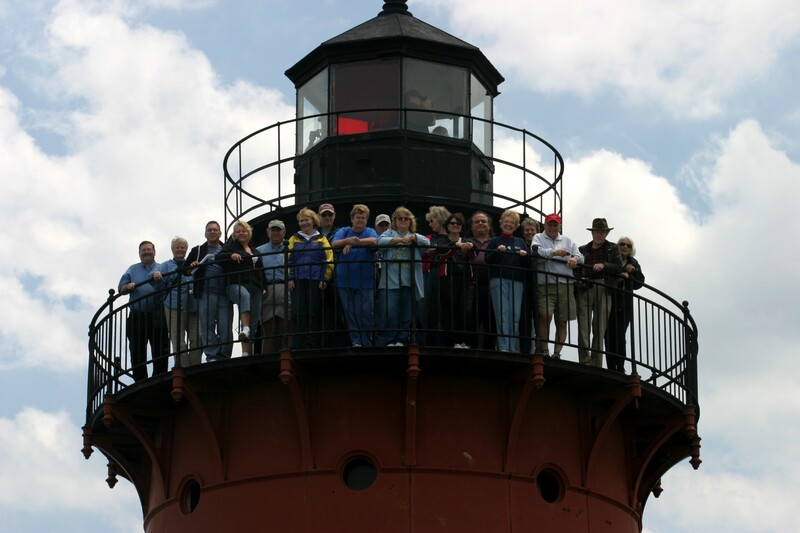 The 2009 summer season at Harbor of Refuge Light Station will begin with a bang – the sound of the closing and opening of the new watertight door now protecting the offshore structure. The door was installed on the lighthouse by the U.S. Army Corps of Engineers during late May, successfully completing the most difficult part of an 18-month joint project between the Delaware River & Bay Lighthouse Foundation and the Corps to fund, design, fabricate, deliver and install the massive new entry. The entire doorway system, which weighs more than 800 pounds, consists of the door, its frame, and a surrounding patch for badly rusted sections of the lighthouse caisson which had to be cut away. It was fabricated by the Marine Division of Railway Specialties Corp. of Bristol, PA, especially for the lighthouse, but is similar to doors the firm fabricates for use on U.S. naval vessels. However, the Corps of Engineers came to the rescue and through its contacts had the door made by Railway Specialties. The company took a real interest in the project and gave the Corps quick turnaround on the work to meet the deadline for planned installation last September. But that wasn’t to be. Late summer storms destroyed the landing dock at the lighthouse and diverted Corps work crews to emergency repairs elsewhere. The door was stored in a Corps warehouse over the winter, and preparation for the installation began again this spring. Foundation volunteers installed a temporary landing deck three times the normal size to make plenty of work space, but the biggest question was how to get the massive doorway onto the light station. Delaware Bay and River Co-op, the oil spill cleanup consortium, offered to help, and officials from DBRC, the Corps, and the Foundation made a trial run in the oil boom deployment boat DelRiver to test using its onboard crane to lift the door from the boat to the lighthouse. “It was a good idea,” Roales said, “but unfortunately, the DelRiver was too big a boat.” It couldn’t get close enough to the lighthouse because of the breakwater stones and it couldn’t be held steady long enough in the complex currents to risk swinging the door over the open water with the crane. The delivery issue was finally solved by Delaware Bay Launch Service, the company that provides transportation to the lighthouse for the Foundation’s regular summer tours. Using a crane at their base in Slaughter Beach, launch crews and Corps workers put the doorway pieces and a small Kubota front end loader onto their largest launch and sailed both to Harbor of Refuge. There the pieces were lifted onto the landing deck using the front end loader and muscled the rest of the way to the base of the lighthouse with pure man power. 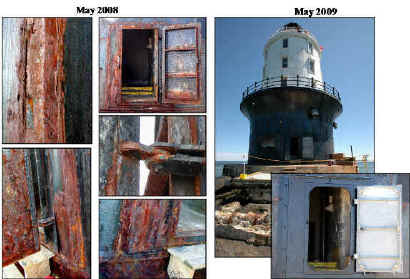 Even then, bad weather interfered again and the door sat at the lighthouse only partially installed for more than a week before workers were able to return. 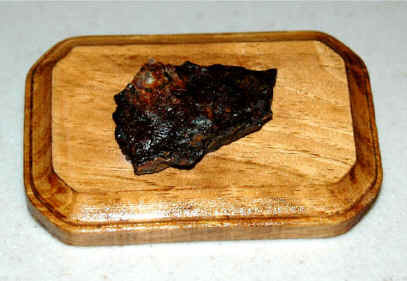 Then there was the task of cutting and drilling the cast iron caisson, which proved to be well over two inches thick. Tools overheated and bits broke. That’s how maintenance and engineering folks at the Lewes ferry terminal became involved -- providing tool support. Then suddenly, it was finished. Late on the afternoon of May 18, Charles Myers, the Corps’ Harbor of Refuge project director, notified the Foundation that the door was fully installed and fully functioning. Keys to the new door were delivered the next morning just in time for a special tour scheduled by the Southern Delaware Tourism office for participants in a conference of the Mid-Atlantic Travel and Public Relations Association. The next step in the project will be to resurface the interior of the caisson surrounding the door and the two-foot thick passageway through the concrete block lining. That work, using a Belzona epoxy product began during the June 13 work trip. Belzona tech rep Vince Brady was on hand to train volunteers and oversee the initial applications. Meanwhile, Roales said, tour participants who have never seen the lighthouse before will hardly be aware there is a new doorway. Although the technology and materials of the new door are thoroughly modern, she explained, to the untrained eye it hardly looks any different than the old door. 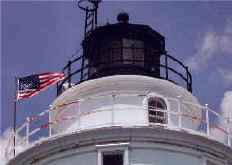 The historic appearance of the lighthouse has been preserved. There probably will also be several trips in May mid to late September for which dates have not been set. Saturday, June 27, 11 am--sold out! Saturday, July 25, 10 am--sold out! Saturday, August 22, 9 am--sold out! As in previous years, all tours will go to both Harbor of Refuge and Delaware Breakwater East End Lighthouses and will leave as close to mid-day as tides allow. Prices will will remain $75 for non-members and $65 for members unless there is a drastic increase in costs. Please click [Tours] here for more details. Call 302-644-7046 to make reservations. Small plaques, measuring about 3 x 5 or 4 X 4 inches depending on the shape, are $10 plus shipping; medium plaques, measuring 5 x 5 or 5 x 7 inches, are $15 plus shipping. Shipping is $4.95 by Priority Mail. But remember, if you are in the southern Delaware area, you can opt to pick up your purchase at the Lewes Chamber of Commerce and avoid shipping costs.